Hi everyone! What a beautiful day it is here in PA, March is definitely going out like a lamb here. 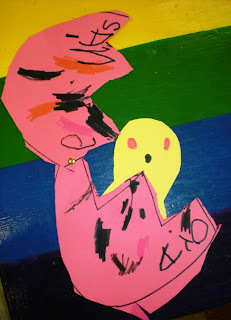 I am also so overjoyed as I had a marvelous day at school, all because of one child. I have a little boy that has been having such a hard time at school, it's just not his cup of tea yet. Everyday is a battle for him to just come into the room. We have days where he is with us for a while, and days where he is not at all. Well, today was great! It was like he totally transformed into a new child over the weekend. He was on target the whole day! I love you, kisses and hugs, singing, playing--it was just a joy to watch. I was so happy--as was mom. As for our day we continued with our Easter theme. It is so great because our room has one of the church's original stained glass windows, in it of Jesus(sorry I don't have a better picture, it's a beautiful enormous window, I took this off the school's site). The window is huge and is so helpful with Easter discussions. I don't go into too much detail, but I talk about Jesus bringing new life for us at Easter. That' how we incorporate eggs, bringing new little chicks, ducks, or birds, and bunnies because all the baby bunnies are born in the spring. New life all around us! 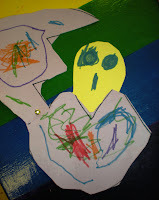 Our craft today was a chick hiding inside an egg. 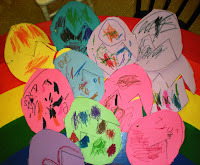 This is one of those crafts where the children are just in awe. Just showing them at the beginning--there are big smiles all around, they just can't wait to make one of their own. 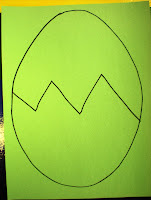 I run the shape of an egg through the copier in many different colors so that we have a variety of Easter eggs. All the eggs have a crack in the middle where the children will cut them apart. 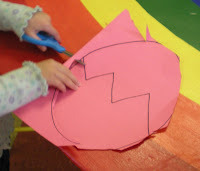 I allow the children to pick the color they want, then cut around the outside of the egg. 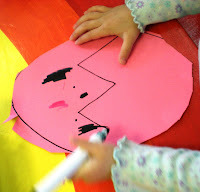 After the egg is cut I let them take markers to decorate their egg. When it is all decorated they finish the cutting by cutting the crack in the middle--all the way across. After the egg is finished, I have them put some eyes and a beak on the chick, then put glue on the bottom, front of the chick. They then glue him onto the back of one piece of egg. The final step is mine. I take a brad and put it in the side of the egg so it will open and shut. All done--peek-a-boo--BIG SMILES! Our book today was a new one to us. It was called "Easter Eggs Everywhere!" by Steve Metzger, illustrated by Kathi Ember. It is a rhyming story which I always love to read. They are so sing/songy and really keep the children's attention. 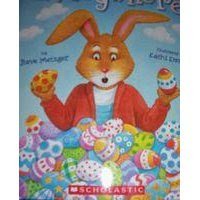 It was a cute story about an Easter Bunny that waited a little too long to get those eggs ready for Easter. Will he get them all done? We did not have a specific skill time today. When the weather gets so gorgeous outside, I always feel that outside time is way more important at this age. So our final part of the day was to swing on the swings, slide on the slide, and just run in circles. Wow-what a beautiful window to have in your classroom!